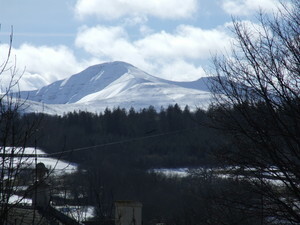 Is it snowing in Pen-y-Fan ?Thank you! The Brecon Beacons National Park encloses around 500 square miles of varied upland scenery, from the Mynydd Du (The Black Mountain) in the west to Pen-y-Fan in the east. This is a fascinating glaciated landscape of wide open moorland, huge sandstone escarpments, lakes, waterfalls, caves, castles and attractive market towns. Pen-y-Fan is the highest point in the Brecon Beacons at 893 metres (2906 feet), and can be reached in about an hours walk from the Storey Arms Youth Centre (sadly, not an inn any more). This is easily the highest point in Southern Britain but looks more like a giant hill with two summits than a Mountain, especially when viewed from the South. 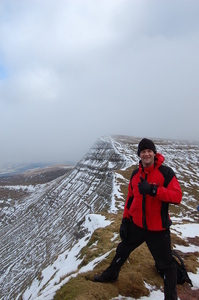 On a clear and snowy day, the views from the top of Pen-y-Fan are awe inspiring - huge vistas overlooking the Usk Valley and the Black Mountains to the north and the forbidding expanses of Fforest Fawr and Mynydd Du to the west. It is hard to imagine that the industry and the cities of South Wales are so nearby. Take extra care when preparing for a trip because the weather at road level is often deceptive. Under winter conditions it becomes a lot more demanding than a gentle stroll in the hills, especially when there is a strong westerly - often be strong enough to blow you off your feet on any exposed ridges. There have been several of fatalities here over the years. After a good fall of snow, especially on a weekend, expect to see a few dozen people snowboarding and skiing on the slopes above the footpath. It was popular enough that an occasional rope tow operated until about 1980 but unreliable snow combined with the advent of dry slopes and cheap flights to Europe means that this is no more. 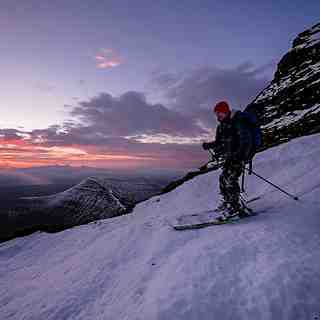 The west-facing ski descents, off Pen-y-Fan, back to the A470 may be the most popular but they are gentle and bland. There are reasonable short and moderately steep east and south-facing descents towards a reservoir from the ridge that runs south from Corn Ddu. Problem is, you are at the bottom in a minute and not many people can face the steep slog back up more than once. This sheltered slope is sometimes the only place where the snow accumulates to any great depth - there can be a few feet of snow here when everything else has been blown away by the wind. 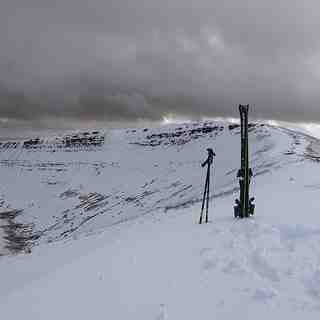 The steeper north-facing corries and spurs of the Brecon Beacons, are far more rewarding when the snow is deep enough and can offer 500m of testing vertical on routes into the classic bowl-shaped cirque of Cwm Llwch or Cwm Gedi that vary from moderate to impossibly steep (for me). If you plan on skiing these, approach from the north (Cwm Gedi or Cwm Llwch Car Parks, at the end of small windy lanes), rather than from A470 at Storey Arms. Other mountains in the national park reward a longer walk in with more varied terrain. West of the A470 at Storey Arms, the east and north slopes of Fan Fawr (734m) can offer a choice of fun descents with big bumps and gulleys and only a few rocks back to the A470. Further west, Fan Gyhirych (725m) Fan Brycheiniog (802m) and Bannau Sir Gaer (749m), accessed from the head of the Swansea Valley, offer some excellent steep descents and steep gulleys too. 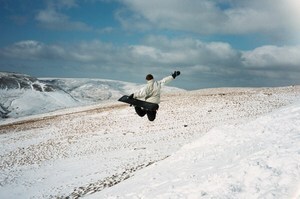 Waun Fach (811m) in the nearby Black Mountains is a really long slog to get to but also has some nice steep west-facing terrain that is rarely visited by skiers and snowboarders. Reading the stories of great but rare days out boarding, skiing and sledding on the Brecon slopes, amazing as it is such a similar story to the Comeragh and Knockmealdown mountains a couple of hundred miles west in South East Ireland where on occasion there has been some fun adventures meeting ski and boarders in the most unlikely places all united by our love of snow. I would love to see this excellent site cover the few slopes we have so that you guys in Wales can read of similar experiences of snow days on your sister ranges to your west.